The tropical pineapple is not a single fruit, it is actually made up of many diamond-shaped fruitlets that have fused together. Although it is available year-round in many places, peak pineapple season is between March and July. 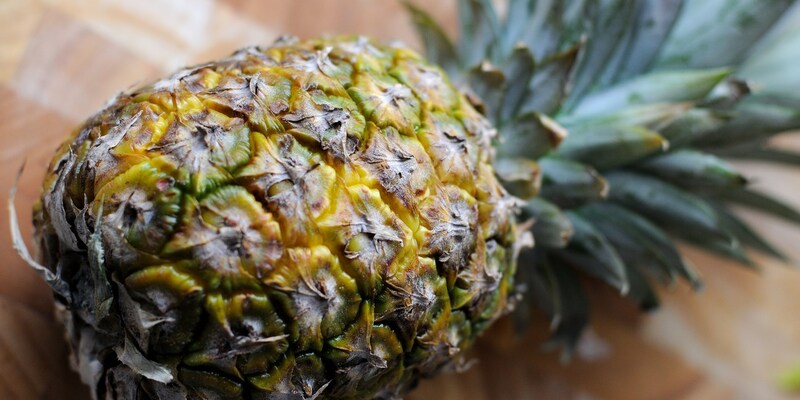 Pineapple juice can be used as a marinade to tenderise meats, as it is full of vitamin C and powerful enzymes which help to break down the meat tissue. Pineapple has a sweet, tangy taste, and can be used in both desserts and in savoury dishes as an accompaniment to meats such as duck and seafood. Browse our tasty collection of pineapple recipes, including Marcus Wareing's pineapple upside-down cake, Chloe King's Pineapple chutney and Simon Haigh's dressed crab with pineapple chutney.